The long-awaited second release by this Utah based five piece is well worth the waiting; they have produced an outstanding album that is at once very forward looking, while also being reasonably accessible – and a major step forward from their 1990 release Don't Panic. The key to Kalaban's sound lies primarily in the dynamics between keys man Michael Stout and guitarist Randy Graves, with strong and precise backing from the rhythm section. The sound travels between heavy, spacy, and moody segments, well arranged and full of energy and atmosphere, into freewheeling jams that border on edgy, approaching Djam Karet in their high energy mode. Only two of the album's five tracks feature vocalist David Thomas, who offers the perspective of accessibility, but even at that, these two numbers are first and foremost instrumental tracks. In summary, this is an album that must be heard to be appreciated, and definitely shows that Kalaban are major players in the progressive scene today. Again a 4 star album. Their second album from 1993 entitled Resistance is Useless. Quite on the same level with the predecessor and having almost the same ideas only with a much more jazzy elements, Kalaban's second album is an excellent addition to my collection. 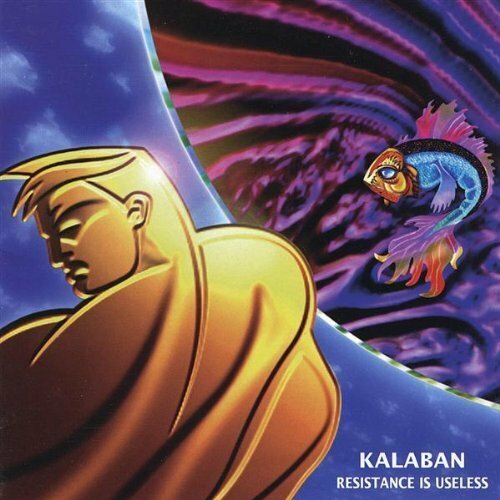 Kalaban is not very popular among prog heads and that one thing is for sure they missing one of the greatest bands from early '90's. They are considered as a strange band, musically speaking, and i don't understand why, they play very tastefully, musicianship is excellent, great pieces with lots of twists and time signatures. Shorter tracks are very ok, but the last one, Eyes of a Seer is an essential piece to listen to if you want something good from the early '90's. So a big 4 for this unknown band and album, but they deserve a much better view by prog listeners. I have always had some tenderness for this group. I discovered it in 1993, thanks to Musea records, at a time where prog rock was still searching for a real revival. Most existing prog bands had more or less a "neo prog" style in the vein of Marillion, IQ, Pendragon, more especially in the UK (Jadis, Grey Lady Down, Pallas, Abel Ganz...). I was quite enjoying the Genesis inspiration of these bands but I missed the rich diversity of the 1970's. Only few groups were trying to recreate the multi-form inventiveness of this period : Anglagard in Sweden, some japanese bands regenerated ELP (Ars Nova, Gerard) and some others. I want to underline that Kalaban has been a kind of pioneer in the rediscovery of a more complex, elaborated, creative prog music just before the emergence of the great phenomenas we well know today (Spock's Beard, Flower Kings, Arena and so on). Of course, it's not a major group. They only released two albums. But they contributed to keep the torch in flame during a somber period for elaborated prog music. The influences on their first record could be found in different styles : UK, ELP, even King Crimson... and it also contained a lot of jazz-rock elements (some parts make me think about Allan Holdsworth)... This second one is more mature : the imperfections and clumsiness of the preceding one, more especially concerning the guitard sound, have been solved. The musicianship is quite good, David Tomas' voice is fine, between Geddy Lee and Robbie Steinhardt, but he makes it swing more ! The music is rich, full of ideas, alternating beautiful intricate epics (Hotash slay : 14,02 mn ; Eyes of a seer : 21,13 mn) and more compact and rythmic pieces : the very jazzy "Topspin" (4,32 mn) and "Possible worlds" (5,29 mn) after its aerial introduction. Epics are very elaborate, often impressive : full of rythm breaks (good rythmic section) and technical guitar and keys' fast developments. This album represents a quantum leap over Kalaban's previous effort in terms of maturity and consistency, full of killer spacy synthesizers and soaring melodic lines, and expansive songs. This is by far my favorite CD from Syn-Phonic's homegrown label. The odd tracks are the ones to pay special attention to. "Dance of Shiva" is a short piece with a very cool piano riff that builds to an over-the-top spacey and expansive ending--a fun opener to the album. "Hotash Slay" and "Eyes of a Seer" are lengthy pieces that build slowly and effectively, with plenty of interesting twists and turns, and satisfying conclusions. But my favorite song on the album is "Sleepless," a reverie of soaring melodies over lush keyboard textures. At some points the band is a little overmatched by their music, and the album production has some flaws. Stout's drums, while competent overall, could be tighter in their patterns, there are a couple of obviously missed notes in the keybaords, and the vocals drift a bit out of tune in spots. But the production does manage to cram in all that keyboard goodness with clarity and presence, ready for your headphones to pump out. And given the fact that we're basically talking about the underground of the underground here, that it exists at all for you to enjoy should be cause to celebrate. I would love to see a new generation of prog fans discover this album. Great production, more mature work, with some remarkable defects and boring parts as well; nevertheless the symphonic breaks through, in the vein of bands such as UK, are excellent... above all the choice of the sounds (those ones from the "Kurtzweil keyboard", but also the digital loops of the other digital synthesizers and expanders) and some good solos at the Hammond organ too. There are some new original ideas, which unfortunately often are not completely developed; it never minds as this album sounds modern and fresh in the same time, and it could be the right new direction to follow, within the modern fusion/progressive American scene at the moment. Schroedinger's cat is a mini-suite, entirely instrumental, which alone makes this work checking out at least!! Above all the excellent rhythmical section and a remarkable symphonic orchestration as well, during the sudden change of mood, let the listener appreciate their stunning odd time signature!! A special mention for the first track "Dance of Shiva", characterized by interesting digital loops re-recorded, a clever use of such guitar interplays and a good singing too, which reminds me of that one concerning the performance by David Lee Roth of VAN HALEN, in his best moments. Instead in other circumstances the vocalist is less convincing, but it never minds! This album is not essential, nevertheless is worth checking out at least, being characterized anyway by a personal imprinting and some original and fresh ideas as well!